After a night at South Camp, at Nxai Pans National Park, we had one night left in Botswana before the long drive back to Joburg. I had seen photos of the famous Baines' Baobabs and heard wonderful things about the campsites there. So we decided that’s where we would head for our last night in paradise. We went to reception at South Camp and enquired about Baines'. We were happy to hear that Site 3, supposedly the best site from a privacy point of view, was available...but it was going to cost us US$ 90. We thought this was quite a lot of money for a campsite with no facilities. But, as it was our last night, we decided to go for it. We packed up camp, whilst keeping an eye out for the elephants that were roaming nearby. There is no water at the Baines' campsites, so we filled up one of our 20L water containers. We also picked up firewood at the shop and jammed it into the back of the Jolene the Jimny, mangling the upholstery on the roof. We headed off down the same sandy track we came along and about halfway back turned left towards the famous Baobabs. The landscape changes quickly from scrubby savannah grassland to the famous Kudikama Pan and its islands of Baobabs. We stopped and took photos of the famous thousand-year-old ‘upside down trees’ that were made famous by Englishman Thomas Baines who painted the trees in 1862 during an expedition through the Kalahari. We drove across the salt pan, making sure to follow tracks made by others and arrived at campsite number 3. Tracks4Africa is a must in this area, as there are very few signs pointing you to your campsite. Campsite number 3 is marvelous. It is set on its own tree island of golden grassland and, of course, it is scattered with baobabs. With camp set up, we went for a walk along the shore of our tree island and admired the endless grey expanse stretching to the horizon. The wind picked up and began to pump as the sun set, so we headed back to camp. Strong wind is apparently quite common on the pans, but you can usually count on it stopping after the sun sets. That evening we had our last bucket shower in the wilderness and cooked Kate’s famous potjie bread and a bean stew. Thankfully we had saved a couple of bottles of wine for our last night, which we drank admiring the stars. The next day we set-off early, as we had a long drive ahead of us. On the sand road to the main gate we came across a family of ostriches, who weren’t too pleased to see us. Mum and Dad were so quick to run off flapping their wings that they left a couple of stragglers behind. We spent all day on the road and made it to the Groblersbrug border at sunset. We pushed on for another hour in the dark to Lephalale, where we found the Palm Park Hotel. We were exhausted and stopped for pizza. We gave into temptation and booked an overpriced hotel room for the night. The hot showers (our first in a week! ), aircon and clean white sheets were much appreciated. Catch up on the first 3 parts of our Botswana adventure: Central Kalahari Game Reserve, Khumaga and South Camp. This is post three from our trip through Botswana. 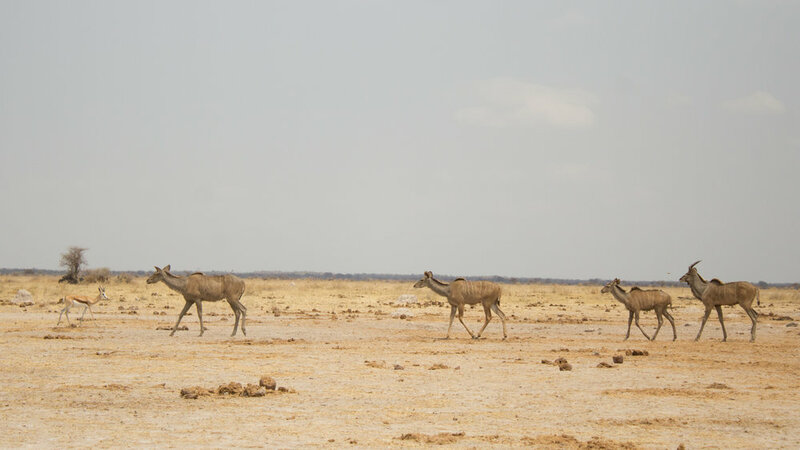 Make sure to catch up on our earlier posts about Central Kalahari Game Reserve and Khumaga. Our sightings at Khumaga had been so fantastic (Elephant swimming across the Boteti river! A male lion on a zebra kill! A jackal fighting off 40 vultures!) that we had our doubts about moving on. We didn’t know if we would find a campsite further north in the Nxai National Park (or if the viewing would be as exciting) but we decided to push on anyway. We broke camp quickly. Kate sorted out the tent: collapsed the stretchers, rolled the mattress, folded the linen and repacked the bags. Ben sorted out the camping chairs and table, repacked our boxes and started packing Jolene. With our car packed we opened the map on the bonnet and plotted our route. We decided to head north towards South Camp and see if we could get a campsite. We knew there would be water so we ditched a couple of 5 litre bottles, which provided much appreciate leg room for Kate. We hopped in Jolene and took the road towards the north gate of the Makgadikgadi National Park. We passed the zebra kill again and had a peak. It was almost completely stripped bare by the vultures. What had two hours before been a red and pink carcass was now bones and dried brown flesh. A few vultures were still hanging around in the nearby trees and flew off as we drove by. The two jackals had long moved on - to shady sleeping spots, we imagined, as they must have had full tummies. The road north was more of the same - sand, sand and more sand (Ben: Kate was asleep for this bit so she can only assume.) As we approached the gate we began to speculate about the possibility of ice. It had become the thing of fantasy for us. Where can we get it? How long will it last? How much are we willing to pay for it? Answer: much more than it was worth. We reached the gate and the receptionist, Becca, started the checkout process. We signed the forms, chatted about recent sightings and bought ice-cold Fanta Oranges. “Do you have ice?” we asked. She smiled and disappeared around the back of the building. She emerged a few minutes later with a couple of 2 litre frozen water bottles. We could have kissed her. We repacked the cool box - positioning gin and tonic supplies next to the ice - and hit the main road. About 15 kilometres later we arrived at the entrance to Nxai National Park. We booked a campsite for the night at South Camp and hit the sand again. (There’s only so much we can say about the sand. It’s tough going.) We had a dicey moment when Ben hopped out for a quick pee and the car started sinking. Sticking Jolene the Jimny into low range and reversing saved the day. We arrived at the reception to find an elephant trunk-deep in an underground water tank. He emerged every few minutes to check on the cars coming and going. The reception has an impressive shop! It's not cheap but there is an amazing selection of supplies and (importantly!) booze. After four days of low rations we stocked up on cold drinks and packets of chips. After signing in we headed to South Camp. It’s a well equipped campsite but not our sort of place. The campsites are very close together. It doesn’t have the feel of a wilderness camp but you will regularly have elephants wandering past your tent. The toilets are protected by electric fences, metal spikes embedded in concrete and locked gates. This is to keep the elephants from breaking down the building to get to water pipes. We relaxed during the afternoon and then headed off to a nearby waterhole with a bottle of wine. We arrived just as the sun began to set and sipped Chardonnay while about 20 elephants jostled for the water. Sunset at the watering hole. The next morning we were up early and headed off in search of cheetah. We didn’t have any luck, though. The highlight of our drive were two bat-eared foxes curled up together in the morning sun. Our next stop was a night at the legendary Baine's Baobabs - a camp on tree islands in the middle of a salt pan.